The Solar Eclipse today is a partial eclipse, but it’s also a very creative one as it occurs in conjunction with Venus and in creative quintile to Pluto and Jupiter. 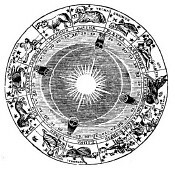 It’s also significant because it occurs very early in the sign of Scorpio (in the first degree) and just after the Sun, Venus, and the Moon enter the sign. This is a time of new beginnings. We have a lot of power to make and shape our image, business pursuits, and our relationships, to set things up to come out winning, and to put ourselves in a favorable light. 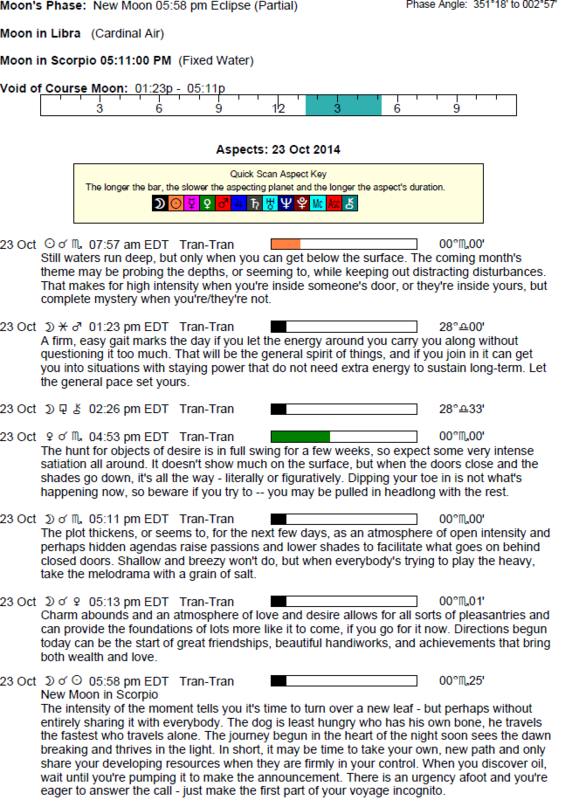 (The chart of the Solar Eclipse is at the bottom of this page). The Moon is in Libra until 5:09 PM EDT. The Moon is in Scorpio from 5:09 PM EDT (until Oct. 26th at 12:41 AM). The Moon is void from 1:23 PM to 5:09 PM. The Moon is waning, and is in its Balsamic phase until the New Moon/Solar Eclipse occurs at 5:56 PM EST, when the Moon begins to wax and is in its New phase. Mercury is retrograde, in the sign of Libra (until October 25th). Review, reflect, and revise. Consider ways to improve negotiations skills, one-on-one communications. 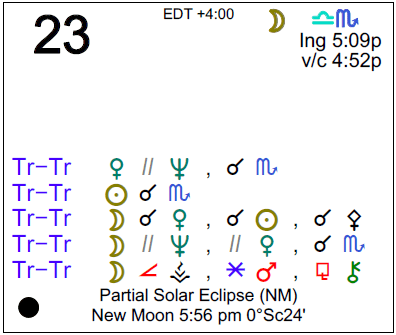 A Solar Eclipse (in early Scorpio) occurs late afternoon – another reason to hold off on major decision-making. The Solar Eclipse occurring today is strong for your intimate life, either with yourself or with someone special. It’s a time for working determinedly on dealing with inner demons. If you’ve been holding on too tightly to a relationship or a financial arrangement, then this is a time for coming to terms with the dependency. Levels of sharing are deepened, but suspicions might also increase. Generally speaking, though, this is a strong time for smoothing over differences. The Solar Eclipse occurring today is in your opposite sign and is in strong alignment with your ruler, Venus. This is a wonderful influence for your close relationships going forward. Negotiations, agreements, and commitments made in the coming weeks can be favorable. Significant new relationships can begin, or you could be redefining current relationships. If there has been a difficult relationship that you’ve been holding on to, this can become an issue now. Your social life can pick up speed. The Solar Eclipse that occurs today begins a re-invigoration process in your work, daily routines, health routines, and diet regimes. You’ll be more motivated to take care of important details, to do busy work, and to reorganize your personal space. Self-improvement is in strong focus. Whether circumstances seem to force the matter, or motivation comes more spontaneously, the days and weeks ahead are strong for building some structure into your daily life. You will be sorting things out and taking charge of your health. If you’ve had difficult work relations or situations, this is a time to start fresh. Clearing up the clutter is important and beneficial now. Today’s Solar Eclipse brings warm energy to your sector of entertainment, creativity, recreation, romance, and hobbies. This is a time of new beginnings and for pursuing your heart’s desire. Events happening in the coming days and weeks bring out your feelings, romantic inclinations, and creativity. You are more aware of your need to entertain, be entertained, celebrate, enjoy, and share yourself with others. Your personal magnetism increases. Those things/projects/people that have been holding you back from expressing your true, creative self may come under scrutiny. You are likely to attract positive attention from others. A Solar Eclipse occurs today and clears the way for new beginnings. Letting go of a situation or attitude that has been holding you back may be part of the process. In the weeks ahead, your attention turns to your home base and personal life. You’re coming into greater touch with your deeper needs and wants. How you support others, and they you, can be important now. Changes and improvements may be necessary as you reorganize your personal life, or shuffle around your priorities. Family and home-related activities can thrive now. It’s a great time to smooth over differences. There could be a previously neglected area of your life that now seems important to revisit. The Solar Eclipse that occurs today begins a wonderful cycle for improving your communication skills. It’s also strong for making new contacts, learning new things, and expressing yourself in new ways (or through different channels). People are truly enjoying what you have to say. You might find that you’re becoming more effective at developing mental rapport with others, or finding it easier to connect and get around. For some, new equipment or transportation options open up. There can be motivation to let go of outdated attitudes or conditions so that the path is clear for new beginnings. News can come that steers you in a new direction. Personal influence and powers of persuasion are especially strong. A Solar Eclipse stirs up activity in your practical affairs. Even so, since the New Moon last month brought a lot of excitement and attention to your personality, generally speaking this will be a less busy and visible period for you. You are starting fresh in some way when it comes to your finances, business affairs, and how you present yourself in terms of self-respect. There can be important discoveries about your earning potential, and your attachment to things. If you have been holding on too tightly to a lifestyle or financial habits that haven’t been serving you well, this is a time when circumstances force the matter. New beginnings are in order. With the Solar Eclipse in tight relationship with your ruler, this is also a strong time for your personal magnetism. Save major launches or decisions until after Mercury turns direct on the 25th. The Solar Eclipse that occurs today is in Scorpio, and it can mark an important personal beginning for you. This is the last Solar Eclipse in your sign for many years, so make it count! There can be big personal changes in the coming weeks and months. It’s a time to reinvent yourself in some personal way, such as with a new look or manner of expressing and presenting yourself. Focus on changing personal habits in such a way as to improve your confidence in yourself, and concentrate on putting your best foot forward, as this is a time when you will get noticed and make a powerful impression on others. You are more independent, feel freer, and more true to your nature in your self-expression. Discover what it is you truly want for yourself and then go for it. Remember that Mercury is still retrograde until the 25th, so ease yourself into this dynamic phase of your life. The Solar Eclipse occurring today begins a new cycle of rest and replenishment for you. This is a period of letting go, reviewing, and recharging your batteries, both spiritual and physical. You could find more personal fulfillment through compassion and service, while others find it natural to withdraw or retreat a little in order to do some soul-searching. You may be feeling like you’ve done the rounds, so to speak, and need more time to yourself, or with yourself! Circumstances are such that they force your attention to your spiritual needs and mental health. There will be a lot of activity in your private life and inner world in the coming weeks. A Solar Eclipse occurs this evening and endows you with wonderful charisma in group settings and with friends. The chance to begin anew is with you in the coming weeks. Making contacts, networking, formulating long-term goals, and connecting with your community can all be in strong focus now. It’s a fabulous time to strengthen ties in a group project or activity. There might even be some drama in your social life that shakes things up enough to get things going. Friends can enter or leave your life. Reflect on how you’d like to steer your life in the coming weeks, particularly in terms of your place in the social side of your life, or in your community. The Solar Eclipse that occurs today is powerful for your career or reputation. You’ll be bringing wonderful energy to your public life, and your powers of attraction rise. This is a good time for new business plans and goals, but it’s also very strong for getting chummy with people in high places, teachers, bosses, and parents as well. In the coming weeks, there can be a pleasing feeling of re-invigoration when it comes to your life-plan goals. There can be important changes in your life when it comes to your own influence or authority, or with authority figures in your life. Some of you will make career changes, and for others, a major shift occurs in your reputation or power. A Solar Eclipse today falls in the sector of your solar chart that rules your spirit to grow, explore, and expand beyond the “regular” experiences in your life. Events occurring now and in the coming weeks can serve to push you out of your routine. In some way, you are breaking from the past. Be sure to take in and draw upon intuition before making important decisions – wait until after the 25th for the big ones. There may be opportunities to broaden your horizons through travel, education, or other form of adventure and life experience. Transportation issues can also be in focus, with new avenues opening up for getting out and about. If Your Birthday is October 23rd, the year ahead is about brand new beginnings, making connections, and making an impression. If Today is Your Birthday full horoscope here. Avoid dramas and secrets. Reflect on the deeper issues in life. Follow your passion. Our relationships can be consuming at this time. We reject mediocrity and superficiality in love, objects of art, business pursuits. We might learn of a partner’s wants and needs. Be wary of secrets. You enjoy challenge and action, and become frustrated when you have no recourse for change. You expect others to also rise to a challenge. You enjoy learning and can have a philosophical outlook on most things. Moon 05° Capricorn 49' 24"
Mars 15° Gemini 53' 19"